A single authentication approach may not work across all customers—protection layers and consumer education produce more dependable results. Boston, January 7, 2016 – It is increasingly difficult for financial institutions to determine if the people they are dealing with are who they claim to be, though FIs have a wide assortment of methods to authenticate their customers. Bankers often lament that U.S. consumers, knowing they will not bear the brunt of fraud losses, don’t care about security yet expect their financial institutions to protect their accounts. 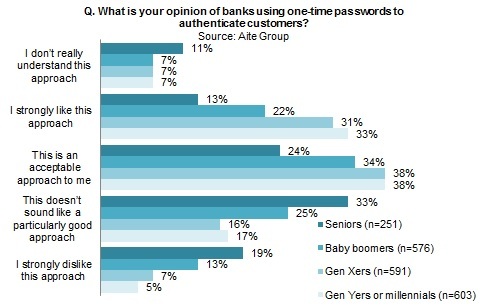 But would understanding consumers’ opinions on these matters be helpful in determining which authentication investments will be the most successful? This report analyzes consumers’ opinions of a number of methods FIs use for authentication as well as their opinions about the bevy of recent data breaches. It is based on a Q2 2015 Aite Group online survey of 2,021 U.S. consumers. This 28-page Impact Note contains 20 figures and six tables. Clients of Aite Group’s Retail Banking & Payments service can download this report.